Is there alignment between the objectives your company has set out to achieve and the way in which the company is communicating with its employees? Are your employees supporting your company’s corporate strategy? 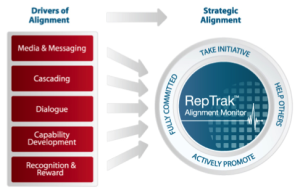 Reputation Institute’s RepTrak™ Alignment Monitor (R.A.M) helps companies assess the effectiveness of their employee communications and identify the best ways of implementing effective programs and initiatives designed to increase employee alignment with strategic objectives. R.A.M is an integrated system that was developed from rigorous research conducted by Reputation Institute, under the direction of Reputation Institute co-founder Cees B.M. van Riel. The focus of the R.A.M system is employee alignment – a measure of the degree to which employees understand and behave in ways that harmonize with the strategic objectives of the company and act in support of strategic initiatives, without being specifically instructed to do so. The purpose of the RepTrak™ Alignment Monitor system is to enable companies to track progress in their attempts to achieve high levels of employee alignment. Research shows that four factors predict employee alignment: Awareness, Attitude, Capability, and Understanding. These four factors are antecedents of support by employees for corporate objectives, and must be carefully nurtured and developed if a company is to maximize its chances of successful implementation of corporate strategies. To benchmark the degree of employee alignment against other companies. Reputation Institute has measured employee alignment using R.A.M in more than 25 companies whose operations span over 130 countries, with survey fieldwork conducted in 14 languages. The growing database enables global benchmarking against a group of major companies.